Team Play - Review — GamingWithSwag.com - Dads By Day, Gamers By Night. 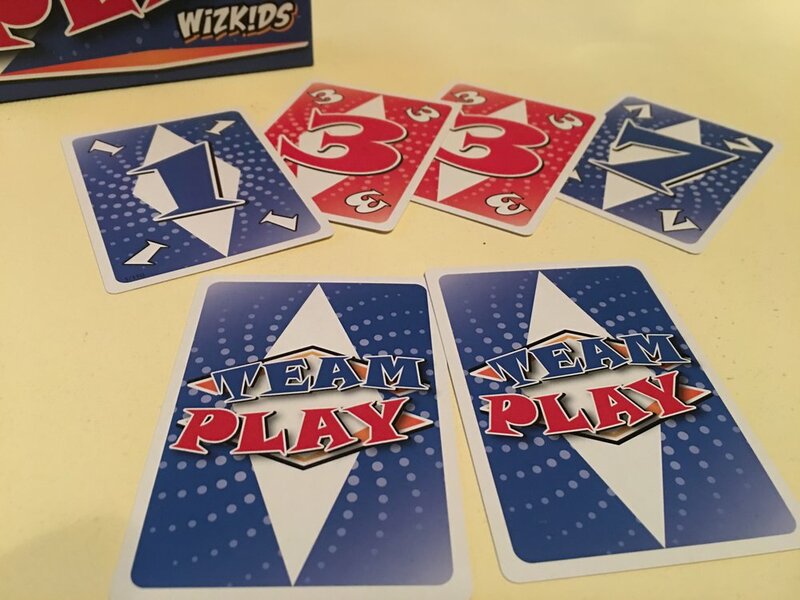 Introduction/Overview: Team Play by Wizkids is the long-awaited American release of the card game which originally came out 3+ years ago in most of the rest of the world. I had heard many extremely positive things about the game leading up to the release, to the point where I was starting to look at buying a foreign edition of the game. So, now that it is in my hands, does Team Play live up to the hype I had built up for it? Gameplay: First of all, the title of the game is a bit of a misnomer, as you can play it without teams (with 3 or 5 players), but I strongly discourage that as it actually removes the most interesting aspect to the game. Assuming you have an even number of players, you play in partnerships. The goal of the game is simple, finish a certain number of Mission cards. Missions are sort of like sets or runs in Gin Rummy, but you need a specific set of cards in order to complete them. For example, you may need two red cards that add up to a certain number, or you may need two pairs regardless of number. Each player gets one “Private” Mission card, and then there is one “General” Mission card that gets played into the center of the table for all players to shoot for. There are over 30 different Mission cards, so there is a wide variety of things to go for in the game. Turns in Team Play are dead simple, first, you check to see if you have more than 6 cards in your hand. If you do, discard down to 6. Then you draw two cards, and finish either your Mission or the general Mission if you can. Then, you can give your partner 1 or 2 cards. As each player’s private Mission is face up, partners can sort of work together in that sense - except there is no communication allowed between partners during this phase. This makes the game. Since Mission cards are face up, you know exactly what cards your partner may be working on, but you have no idea which one they are actually working on. With the 6 card hand limit, it’s nearly impossible to work towards both cards at the same time, so you might be setting them up for a great play, or making their life extremely difficult. Once one team completes the correct number of missions, each player gets one more turn. Teams then score the points listed on the Mission cards they completed. High score wins. That’s basically the game! Rulebook: The rule book explains the game well, and gives plenty of examples of the various Mission cards, so understanding things are pretty simple. Set-Up/Takedown: Shuffle up the two decks of cards, and deal. Components: I really dislike the look of the Wizkids edition. The whole game, from the box down to the font of the numbers is just plain ugly. The original version looks a bit sterile, and less wacky than the Wizkids version, but I greatly prefer it. I suppose this style may draw families towards it, and I think it would be a good family game, but I’m pretty much ready to trade this version in for an original copy. Also, the iconography for “Even” and “Uneven” cards (unsure why they didn’t call them “Odd”...translation quirk?) is either a straight line, or a slightly crooked line. From across the table, it can be hard to discern which type of card it is. Solo-Play: There’s no solo mode in this team-based card game. Final Thoughts: Team Play is kind of a mixed bag for me. I really dislike the design of the game, and I would never recommend it with 3 or 5 players. 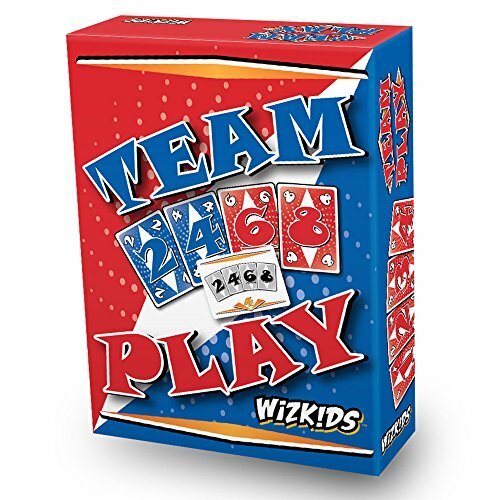 Yet, as a 4 or 6 player game, this one is a great deal of fun to play. It’s a nice, breezy game that’s good for families or as a casual filler or cap to a game night. I tend to not like team / cooperative games, but this one’s nowhere near as pressure packed as others I’ve played. If you have an even number of players in your group, I recommend Team Play. For now, I’m off to find the older edition!